In 2013, Christoph Lakner and Branko Milanovic published a graph—quickly dubbed the “elephant chart”—that depicts changes in income distribution across the world between 1988 and 2008. The chart has been used to support numerous reports of rising inequality fueled by increased globalization. Every time a populist movement rises, every time the elite gather in Davos, every time Oxfam publishes a new report on inequality, the elephant chart resurfaces. The global elite, in particular the top 1 percent, have enjoyed massive income growth over the past decades. Their high income growth, coupled with a high initial share of income, implies they continue to capture a large share of global income growth. This can be seen in the elephant’s raised trunk. The global upper middle class has seen its income stagnate with zero growth over two decades for the 80th This appears to corroborate data showing stagnant real wage growth and other frustrations fueling populist politics in rich countries. This can be seen in the depth of the trough at the base of the elephant’s trunk. The global middle class has risen rapidly as select developing countries have begun to converge toward rich countries. Countries like China have lifted large impoverished populations into the middle class. This can be seen in the graph’s peak at the elephant’s torso. The global extreme poor have largely been left behind, with several countries stuck in a cycle of poverty and violence. This can be seen in the elephant’s slumped tail. This paper examines how these four parts of the elephant chart—tail, torso, trough, and trunk—hold up to new data and new methods. 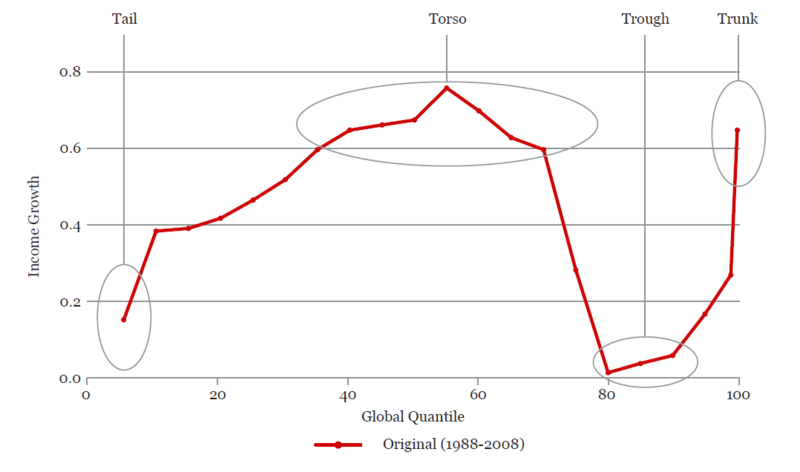 We caution that while elements of the original story have certainly been confirmed by other data in other contexts, the elephant shape itself may be an overburdened and inaccurate depiction of what is really going on in the world economy. We return to the original chart and, step by step, make modest adjustments and updates to the data and methodology. We use the most recent update of global price comparisons (the 2011 purchasing power parity data, rather than the 2005 PPP series). We add surveys for countries that did not have data available when the original chart was published. We also extend the period to 2013, thereby including post-recession years. We further add data from countries with only a single household survey, making distributionally neutral assumptions about their growth incidence. This permits the broadest possible country coverage—our analysis is truly global in that it covers 97.5 percent of the world’s population, compared to around 80 percent coverage in Lakner-Milanovic version. Methodologically, we also compare the Lakner-Milanovic approach with an alternative method that better approximates the way the elephant chart has been (mistakenly) understood. This method, called a quasi-non-anonymous growth incidence curve, holds the country composition of each global decile constant across time and therefore shows the fate of specific economic classes in specific countries over time. In doing so, we find that the primary narrative is one of convergence: Poorer countries, and the lower income groups within those countries, have grown most rapidly in the past 20 years. The data do not support the idea that the poorest people are being left behind, nor that the richest are taking all the income gains. This is consistent with other findings. According to the World Bank, inequality between countries is falling, and inequality within countries is falling in many places as well. The World Bank also finds that there is little difference in growth rates among the lowest 95 percent of the global population. One caveat: our analysis is based on household survey data only. Household surveys are notoriously weak in coverage of the top and bottom of the distribution and the representativeness of the sample gets worse at each tail. For this reason, we use grouped data that records the mean income of each decile or percentile of each country’s distribution, and even for the world, we do not try to make finer distinctions beyond the top 1 percent—but recall that around 1990, 1 percent of the world is still over 50 million people. For many discussions, this is too crude a breakdown; for example, it does not distinguish between millionaires (about 16 million globally) and the rest. To address this data shortfall, the World Inequality and Wealth Database (WID) spearheaded by Tony Atkinson, Thomas Piketty, Emmanuel Saez, and others has developed alternatives using tax administration data. These give a far different picture of what is happening at the very top, which we examine as well. While these efforts have brought a welcome empiricism to conversations about top incomes, the estimates remain controversial. As we unpack the elephant, it becomes clear that the distributional gains from the past 30 years of growth and globalization are far from settled fact. See for example Aiyar 2017 or Auten and Splinter 2018.